Biometrics for Remote Desktop is a reliable software solution that allows to redirect locally plugged fingerprint scanners to remote desktop session. In standard situations, using fingerprint readers in a remote desktop environment is problematic or even impossible. Normally you would have to use some complex workarounds. Biometrics for Remote Desktop allows to redirect biometric scanners to remote Windows session, with a single mouse click. Biometrics for Remote Desktop is extremely easy to use. The solution consists of two parts: Workstation and Server. The Workstation part should be installed on the local computer and the Server part goes to the remote server where you login via RDP, PCoIP or Citrix. As soon as both parts are installed, no additional configuring is required. Every time you login to remote session, biometric devices are transferred automatically. So, any software that requires fingerprint scanner input being launched in remote desktop sessions can work as if the scanner was plugged directly to the remote side. USB device drivers are not required on the remote side. It's really important since the most of USB fingerprint scanners are not designed to work in Terminal Server environment. And usually there are no drivers for Windows Server. 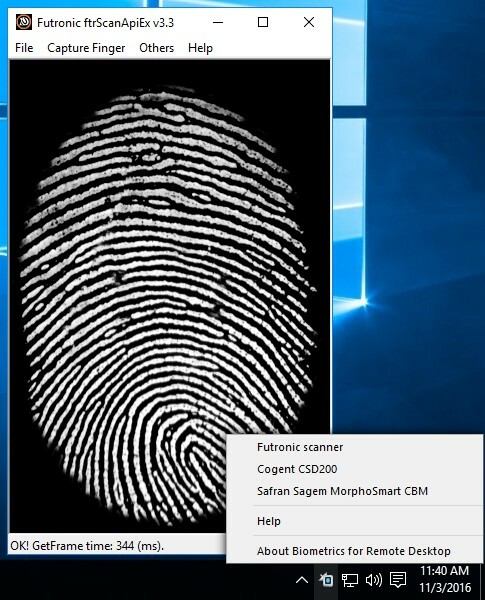 Using Biometrics for Remote Desktop makes it possible to use fingerprints in Terminal Server environment even without having USB device drivers. In case of multi-user environment (Windows Server 2008, 2012, 2016), if there is more than one user logged in to the remote side, each fingerprint scanner is isolated within its individual session so you don't need to worry that somebody else will get access to sensitive data. Each user can see only own fingerprint scanners within the remote session.